It's finally time—time for McDonald's menus across the country to run red with pale pork shoulder drenched in barbecue sauce. The Jesus of fast food has returned, as foretold by prophecy and marketing. Just as Christianity was offered as an alternative to the pagan ways of ancient people, so was the McRib offered as an alternative to the chicken nugget. According to McDonald's first executive chef and father of the Chicken McNugget, Rene Arend, the McRib was created in 1981 as an answer to the overwhelming demand for his more notable creation, which debuted in 1979. Lacking the supply of chicken to keep McDonald's locations across the country in McNuggets, Arend formed ground pork shoulder into a rib shape, placed it lovingly upon a bun, slathered it with pickles, onions and sauce and christened it the McRib, because no one would eat the McShoulder. Well, no one but me. I'd eat McShoulders all day long. Initial reactions to the sandwich, much like Jesus, weren't particularly favorable. Folks in the Midwest loved it, but it was removed from the national menu four years after its debut due to mediocre sales. After several years entombed, the McRib rose from the dead in 1989, returning on a semi-regular basis to bless the country with its divine shape. It's a story of temptation. It bears noting that the sandwich was so popular in Germany, land of eating all the pigs, that it's a permanent fixture in the country's McDonald's restaurants, where it is called Royale with Cheese (no it's not). 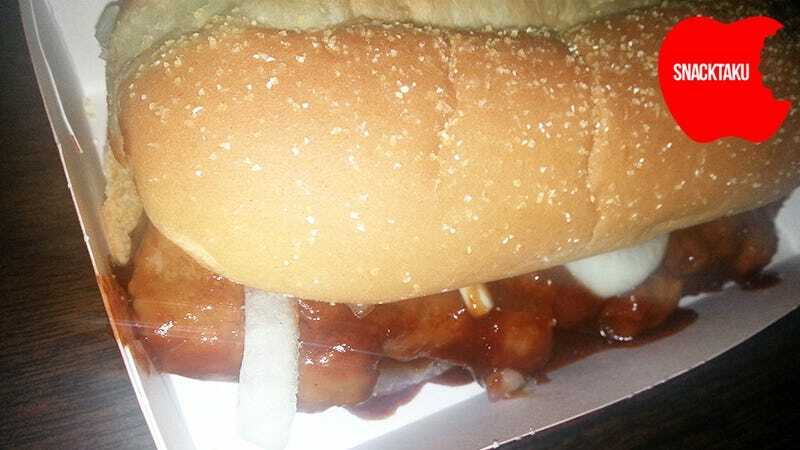 At this point in the McRib's history it's hard to determine how much of the sandwich's appeal is the taste and how much is novelty. In case you as confused as I once was, I offer you this simple test, utilizing another famous limited time only snack—the Cadbury Creme Egg. Step One: Eat five Cadbury Creme Eggs. I know you've got them in your freezer. Step Two: Eat five McRibs. Step Three: I should have mentioned to wait a few days between step one and step two. You're probably feeling really ill right now. You should go lay down. After eating five Cadbury Creme Eggs in a row you'll probably want to die just a little. If you're anything like me, eating five McRib sandwiches will leave you feeling queasy, but not so much that you wouldn't run out to McDonald's later that evening to pick up another one. It helps if you don't look at them up close before eating them. That is not attractive. That looks like someone dropped random scraps of food on top of something left over from an operation ending in -ectomy. I imagine that's what my spleen looks like, at least on the outside. And on the inside—let's just be glad McDonald's decided to drench this thing in barbecue sauce, because that is not a pretty color. The McRib won't win any beauty contests, not unless the beauty contest had a flavor competition, which is a tangent I'll let your mind wander along as I get down to business. It's not about the pork. After eating two of these since Saturday evening, I cannot for the life of me describe how the shoulder in this sandwich tastes. It's not a flavor. It's a texture delivery device for the wonderful combination of sauce, onions and pickles, something to chew on to keep us from mixing up a big ol' jug of BBQ-pickle-onion-ade. Anything would taste the same under this onslaught of overpowering toppings—even Jesus. Now before everyone gets all up-in-arms at the suggestion of an onion, pickle and Jesus sandwich, I spent upwards of 100 Sunday mornings with the body of Christ stuck to the roof of my mouth in wafer form. Had they offered it on a bun with some fixings I'd probably still be going to church today. Well, not today, it's Monday. McDonald's has spent the past couple of decades teasing us with the return of our flavor savior, each year giving us a small taste, enough to keep us coming back to worship at its cardboard container at regular intervals. The McRib will likely never come back for good, and I'm fine with that. We'd just wind up taking him for granted.